A band entertains in Coolidge Park at last year's Make Music Chattanooga. 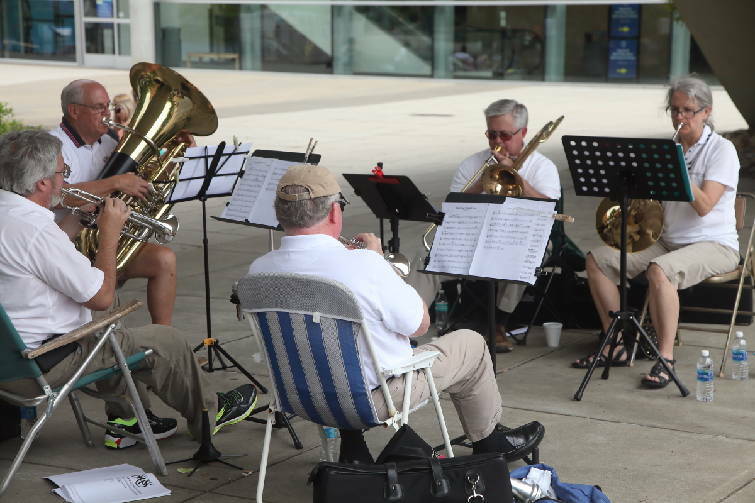 A brass quintet performs during last year's Make Music Chattanooga. › Chattanooga Public Library, 1001 Broad St., noon-6 p.m.
› Coolidge Park, 200 River St., noon-9 p.m.
› East Lake Park, 3000 E. 34th St., 10 a.m.-1:15 p.m.
› Feed Company Table & Tavern, 201 W. Main St., 11 a.m.-7 p.m.
› Goodwill Store, 7601 East Brainerd Road, 3-6 p.m.
› Hair of the Dog Pub, 334 Market St., 9-11 p.m.
› JJ’s Bohemia, 231 E. M.L. King Blvd., 8-11 p.m.
› Make Music School, Chattanooga Choo Choo Gardens, 1400 Market St., 9 a.m. -6 p.m.
› Miller Plaza, 850 Market St., 1:45-4:15 p.m.
› Music on the Move, Chattanooga Public Library to Camp House area, 1010 Broad St., noon. › Passageways: Garden Grass Inversion, 730 Cherry St., 1-3 p.m.
› Passageways: Urban Chandelier, 709 Cherry St., 3-6 p.m.
› Piano Park, 40 Frazier Ave, 11:30 a.m.-8:30 p.m.
› Puckett’s Restaurant, 2 W. Aquarium Way, 5:30-8:30 p.m.
› Riverside Wine, Beer and Spirits, 600 Manufacturers Road, 5-8 p.m.
› Seed, 199 River St., 3-4 p.m.
Fifty-eight local musicians will perform in 16 venues around town on Wednesday, June 21, as part of Make Music Chattanooga. Make Music Chattanooga will be part of a world-wide celebration of music that day designed to bring music to the people through performances by soloists, duos or groups in public places ranging from business offices to parks to city sidewalks. It's a day to celebrate local talent and the variety of music they create. 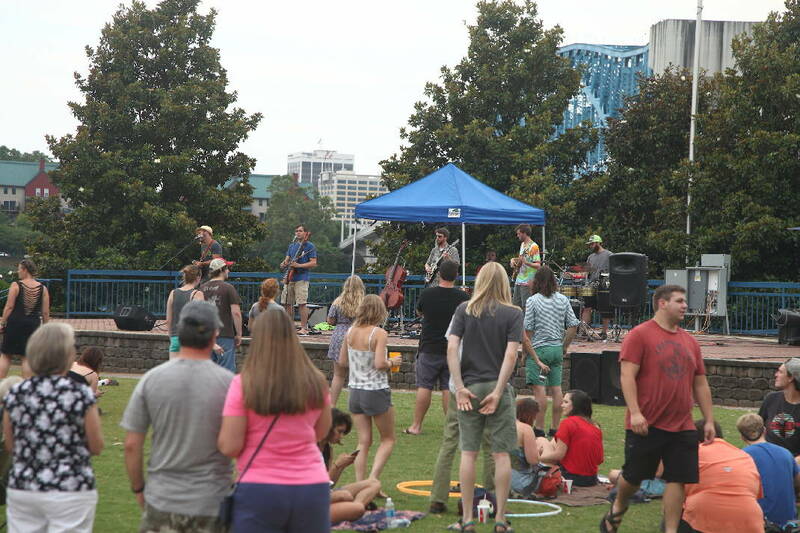 "This is the second year Chattanooga has participated in Make Music Day," says Taryn Balwinski, founder of the Chattanooga branch of Make Music and coordinator of Wednesday's performances. "We had 75 artists participate last year. We have 58 officially on the schedule this year, and we have different opportunities for people to participate the day of, so I expect we'll reach 75 again." Balwinski says a follow-up survey after the launch of Make Music Chattanooga got positive feedback from participants as well as spectators. "Performers were glad to have the opportunity and a lot of people listening said they were excited to discover a new artist they usually don't see. Since it's all free, you can walk up and discover somebody you didn't know before." New events have been added as well as the Mp3 Experiment in partnership with Improv Chattanooga, in which participants who sign up will receive a link to an audiofile to be downloaded. On the day of the experiment, participants will meet at Coolidge Park, listen to the instructions and follow them. "They'll know what they are doing, but anybody who is watching won't," says Balwinski. Balwinski says musicians desiring to participate in Make Music Chattanooga had a specific date by which to respond. But those who didn't will still get their chance to play. Procrastinator's Passageway is for musicians late to register to take the stage at an open-mic session in the Urban Chandelier Passageway, 709 Cherry St. Mosey up to the mic between 3 and 6 p.m. and wait your turn in line.
' Saxophonists will pop into nonmusical locations to play "Careless Whisper" in memory of George Michael during the day. Balwinski says saxophonists are still needed for these surprise saxophone solos; sax players should email Chattanooga@MakeMusic Day.org with the subject "Surprise Saxophone Solos" to get more information and to register.
' The CSO and Chattanooga Girls Rock are partnering to present an instrument petting zoo from 11 a.m. to 1 p.m. in Neural Alley Passageway, 721 Broad St.
' All performers are invited to walk up and sing or play an instrument at Undaground's Street Studios. This music will be included in an original song created from samples recorded Wednesday. The Street Studio can be found in the Garden Grass Inversion Passageway, 730 Cherry St., from 1-3 p.m. Regiser at makemusicday.org. All events throughout the day are free, says Balwinski. There will even be free instrumental lessons in the Choo Choo Gardens, which just might tempt a newcomer into wanting to learn more about playing an instrument. That schedule includes guitar lessons at 9 a.m., ukulele lessons at 11 a.m., drum lessons at 1 p.m. and harmonica lessons at 4 p.m.
For more information and complete schedules, check the Make Music Chattanooga website at makemusicday.org/listings/chattanooga/2017/locations.